Today for #SundaySupper we are sharing a dish with you that is not processed. That’s pretty easy for me, considering I really do try to eat unprocessed foods. I was looking in my fridge to see what kind of dish I should make and I ran across some Brussels Sprouts and thought hmmmm, I haven’t had sprouts in a while. 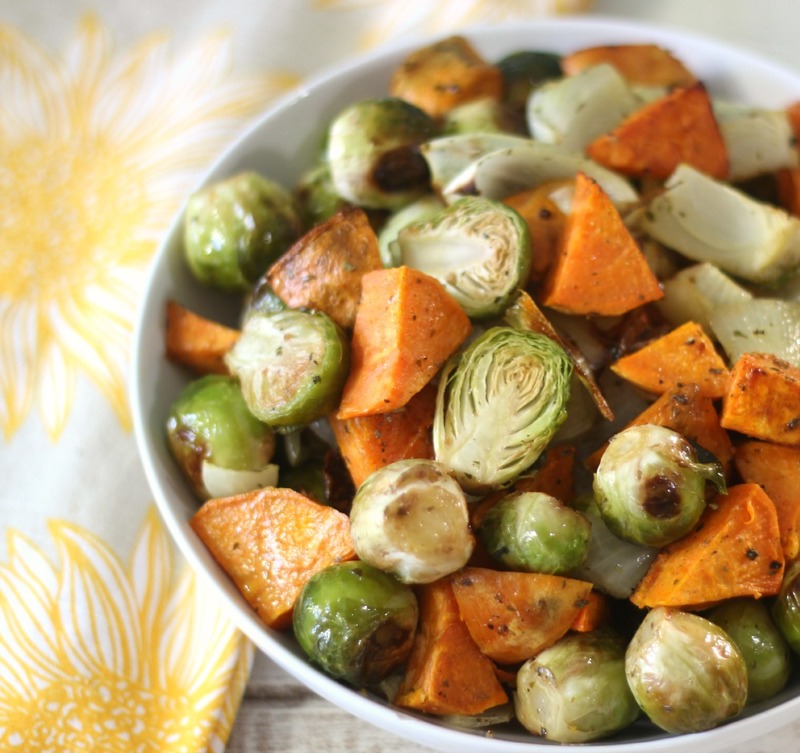 Then I decided to throw in some sweet potatoes and onions and out came today’s recipe, which is Roasted Sweet Potatoes and Brussels Sprouts. 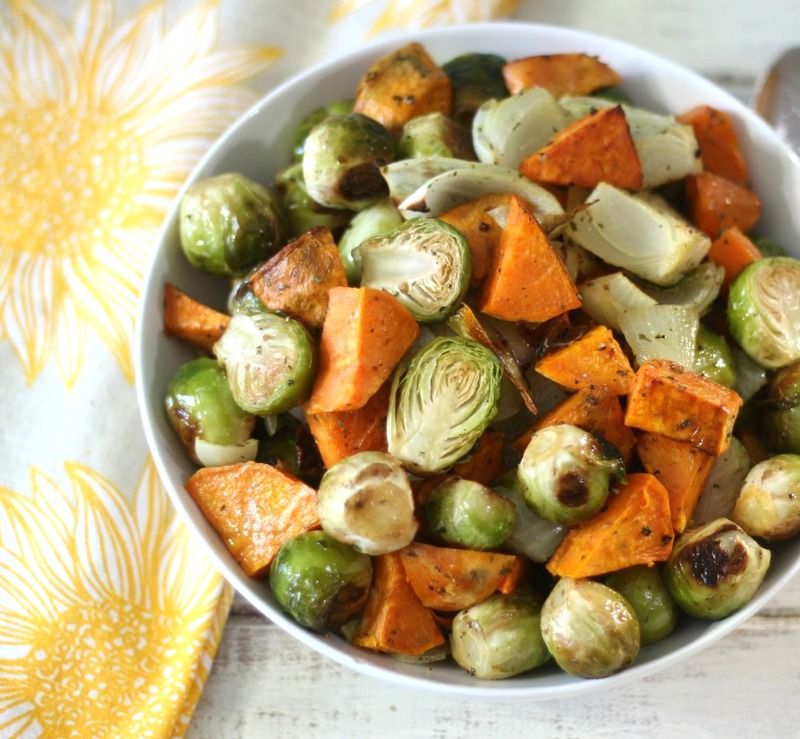 This dish screams Fall to me! The potatoes are fork tender, the sprouts are roasted to perfection and I topped my side dish with olive oil, parsley and oregano. This truly makes a great dish for your holidays. Yes I am already thinking Thanksgiving. It’s funny, when my Husband came home from work, he said it smells good in here. Then he saw the dish and said, sweet potatoes, ugh… As much as I try, he does not like sweet potatoes. This dish is totally me. I love to eat it straight from the oven or I even will eat it cold. I know it sounds strange, but it’s so good. 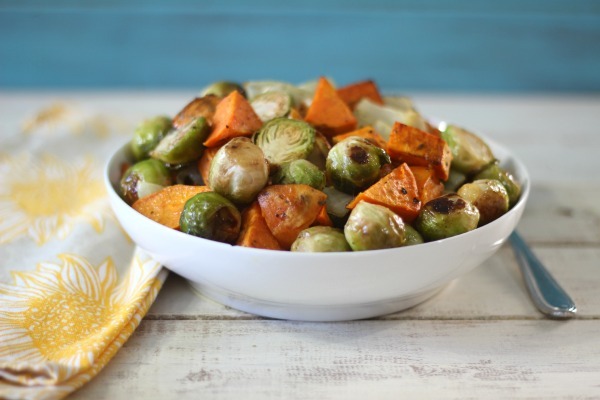 A simple, flavor, vegetarian side dish made with roasted sweet potatoes, Brussels sprouts and onion and seasoned with herbs. Line a baking sheet with aluminium foil. Add potatoes, onions and Brussels sprouts to baking sheet. Drizzle with olive oil and sprinkle with parsley, oregano and salt and pepper. Mix until all vegetables are covered with olive oil. Bake in the oven for 30 minute, flipping half way through. Cook until potatoes are fork tender. Yummy! As I am writing this I have a little bowl of my side dish, well it actually became my dinner. Hey, how can it not be? 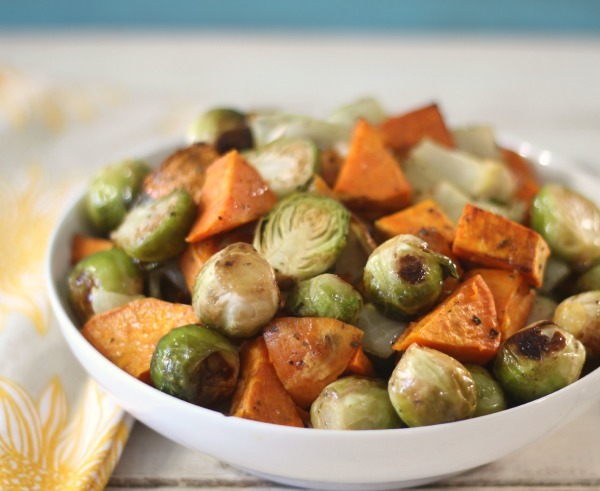 It’s healthy, flavorful, easy to make and I am a huge fan of roasted sweet potatoes. I can’t wait to see what dishes the #SundaySupper gang makes that is unprocessed. What a beautiful dish! 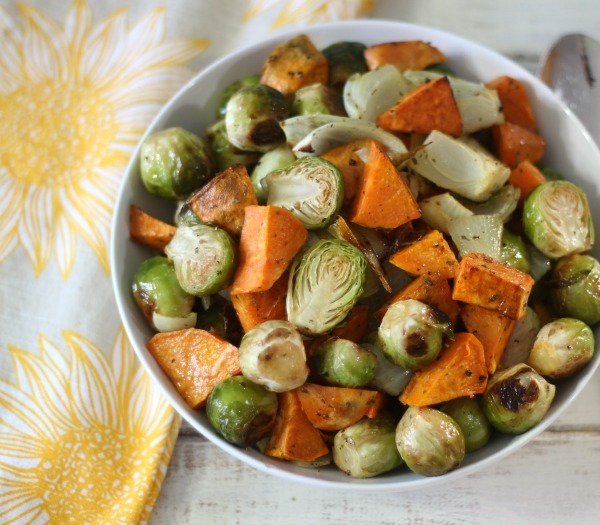 One of the foods I most look forward to in fall is brussels sprouts! Two of my favorites together, yum! Two of my favorite items on the produce shelf–I love this combo so much, can’t wait to give it a go! Cheerios! Hi Mayra, Let me know how it turns out. Enjoy! !